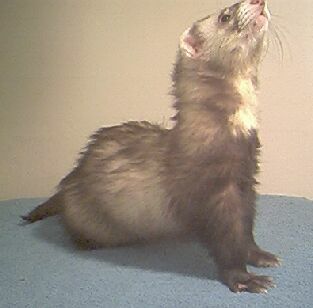 Madmartigan came to us in 2003. He also came in with a bang, winning the Sable Specialty at the 2003 LOS National, then topped that off by winning Best Specialty in Show. He sired a gorgeous litter of kits that same year with TPP Princess Kitana of BD and another wonderful litter in 2004 with DF Sorsha of BD. 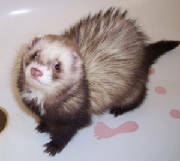 He's very much a "gentleman" when it comes to the ladies, and has a just super temperament and attitude towards ferret life. Don't let the name fool you, Vicious is actually a VERY sweet boy who loves to kiss and play! 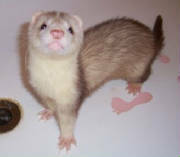 We named him in part after one of my favorite Cowboy Bebop characters and also for the irony that a ferret named Vicious is actually one of the sweetest I've ever met. We're looking forward to pairing this wonderful muttly chocolate boy with Rayden this year (HFLR's Rayden of BD - see the Jill's Page) and we're also very excited about starting him on his adult show career this March. 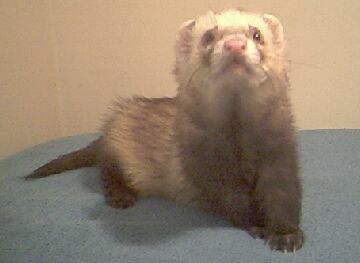 Elrond came to our ferretry in 2003, and started his "entrance" before he even got here! His breeder, Dawn Smith, showed him for me in an all specialty show in early October, 2003, in which Elrond took 1st in the Siamese ring. Not bad for a kid who isn't even a year old! 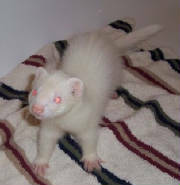 He sired a kit with SHD's Sethra LaVode of BD in 2004, who turned out to be a spitting image of her daddy. Dante is our "keeper" from our litter in 2003 with PCF Heart of Independence of BD and SHD's Sethra LaVode of BD. He's a gorgeous cinnamon panda with that rare true red tipping to his guard hairs (I wish my camera were better, as this pic truly doesn't show him off that well). Dante is my escape artist, and constantly keeps me on my toes...but who can blame him? There are lots of pretty girls here to flirt with! 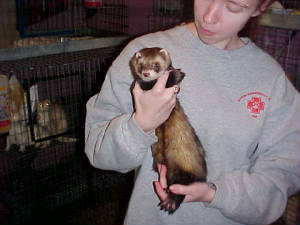 Mace is Satine's nephew (his mother, Zelda, is her littermate). He's a complete camera ham who reminds us very much of his great grandfather, Q. He'll be starting his show career this fall in Pennsylvania. We'll keep you posted! Zaphod (so named for the outrageous character in Hitchhiker's Guide To the Galaxy), is our keeper from this year's litter with Doug E. Doug of DF and CPF's Venomous Poison of BD. He's a cute little silver shaded chocolate blaze, and we're very anxious to start him off in the kit classes this fall. 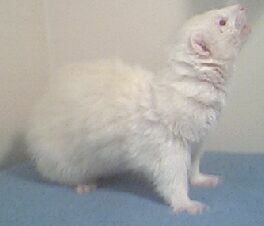 His brother is still available...check out the kit page! Miroku is one hunky boy that's just as sweet as can be. He's from our Canadian line, and his grandfather, Edward Hyde, lived to be just over 10. 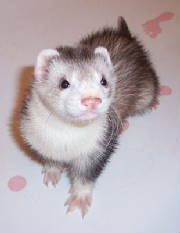 Miroku, like his namesake, really loves the ladies, and is one of the biggest flirts I've ever seen...with humans and ferrets alike! He's a total cuddler and is my constant shadow during playtimes. 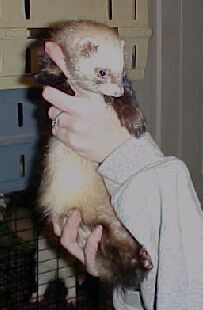 "Scotty" came to us in 2003, and made quite a debut his first year! He won 1st in Mutt Specialty at the 2003 LOS National and did quite well in Judge's Cup. He's a gorgeous chocolate mitt (though a bit on the muttly side!) with an awesome personality. Full Scottish background. This is Elrond's full brother, Aragorn. I literally picked him and his brother out when they were 2 weeks old! He's a spunky boy, and quite a muttly shade of sable with toes, bib and knee markings. Spike is our newest bino boy! He's a monster, too, weighing in at just over 5 lbs. 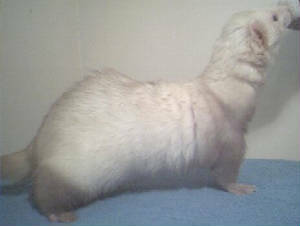 Spike has fit in very well with our showing and breeding program, and had a beautiful kit with DF's Elven Arwen of BD this year. 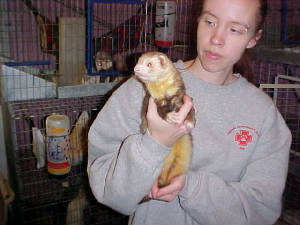 Her name is Aliera, and at her first show in September of '04, she took Best Female Kit at the bare minimum age of 16 wks!! Sesshomaru is our playful baby boy! 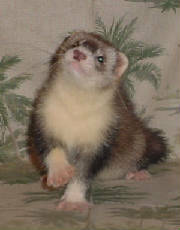 He will be worked into the breeding program in 2006 and his first show will be in September, 2005. Sesshomaru is extremely playful and loves to chew on EVERYTHING! He also likes to steal things, such as shoes, keys, the cordless phone...anything he can get his little paws on!! He's such a character, and one of my favorite pranksters. 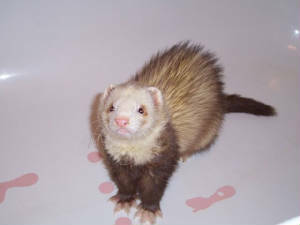 Qui-Gon is one of our older hobs. He's 6 this year. Qui is also a 2nd generation Australian import and a very lovely sable point with an awesome personality. In his 6 years, we've considered him a v-hob backup, as he's never produced. Well, this year, he gave us a surprise! 9 babies born to him and DF Sorsha of BD! We have 7 survivors, and you can check out who's available on the Kit page. Silas just turned 4 months of age at the time this photo was taken. He's our keeper from Sorsha and Qui-Gon's litter this year, and is quite the handsome bino boy! He will also start showing this September.